Now that our time in Europe on our RTW adventure is coming to a close, we’ve been doing a lot of reflecting. 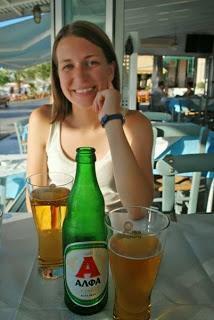 And since I love food, I tend to reflect on that aspect of our time in Europe a lot. We’ve had a few truly terrible meals, lots of mediocre meals, and a handful of simply spectacular drool-worthy meals in the last 150 days. Many of the best meals were not fancy; in fact, most of them involved in-season, fresh, high quality ingredients that were allowed to shine through because of the simplicity of the dishes. 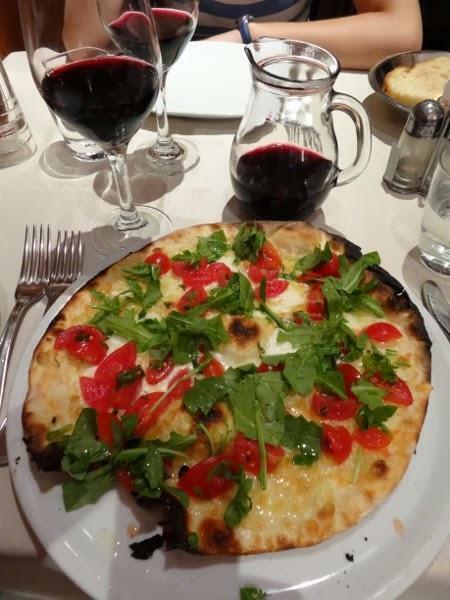 Of course, when we think about our favorite meals, atmosphere also comes into play. Things like sunsets, cool buildings, or unique cultural experiences were present in most of our favorite meals, although atmosphere alone certainly doesn’t always make for a great meal. When it comes down to it, only a few meals can be called "the best," and the following six were the highlights of our five months exploring Europe. I know having wonderful crepes in Paris sounds incredibly cliché, but trust us: not all crepes are created equal. The crepes at Creperie Josselin stood out immensely compared to all the rest we tried in Paris. 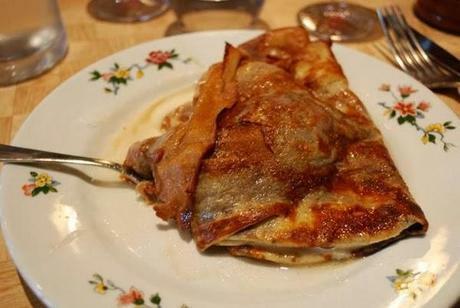 Made with buckwheat flour, the edges of the crepe were delightfully crispy. 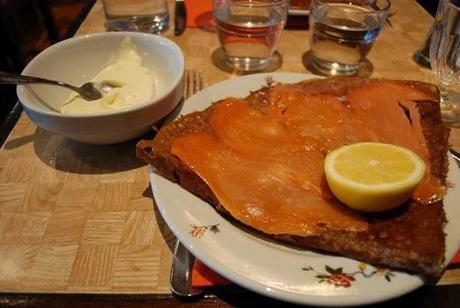 The savory crepe fillings we tried were perfect: egg, ham, cheese, and onion for one; smoked salmon for another. However, the dessert crepe we tried was the star- vanilla ice cream stuffed inside the crepe, while sugar and Grand Marnier were flambéed on top. The whole thing melted into one sweet, creamy, orangey mess. Knick knacks all around the restaurant gave it a homey feel, and the relative lack of tourists made for a very “French” experience. Recommended to us by our Airbnb host, this place had a sort of garden feel to it with floor to ceiling windows and tables outside on the grass. 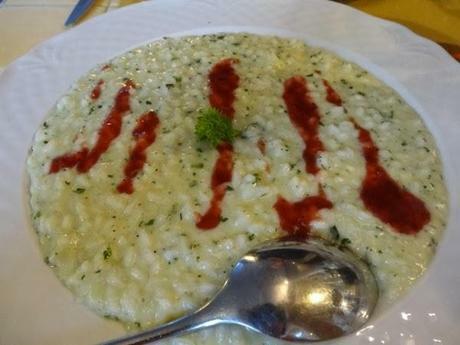 We started off with a risotto dish with goat cheese, basil, mint, and strawberry sauce. The creaminess and tanginess from the goat cheese were perfectly balanced by the herbs and the sweetness of the strawberry sauce. We only got one serving to share, and immediately wished we had ordered two. Next we tried some focaccia with fresh mozzarella, tomatoes, and basil. At first it was kind of odd that the toppings were placed onto the bread after it was cooked, so the toppings were raw. But then we tasted the toppings and realized that they were so fresh, cooking them would have been an insult. 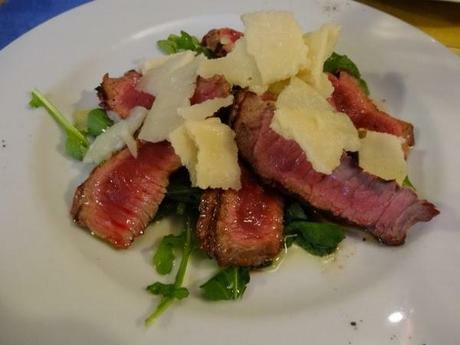 For our main course we tried Tagliata alla Fiorentina, which is sliced steak served on a bed of arugula and topped with shavings of Parmigiano-Reggiano. The steak was nice and pink in the center, and the bold cheese stood up well next to the rich meat. All of this was washed down with house red wine, followed by digestives of grappa for Jeremy and limoncello for me. This was definitely one of those meals where you leave thinking everything is right in the world. Jeremy says the pizza he had here was probably the best he has ever eaten (and he’s had a LOT of pizza)- simply mozzarella, arugula, and cherry tomatoes, without any tomato sauce. Unfortunately I couldn’t eat it because the owner was convinced that it was going to kill me due to my tree nut allergy. He seemed to think there was some kind of nut oil in the oil that they used in the pizza dough. I highly doubted it, but he was so insistent that I figured I should just take his word for it. 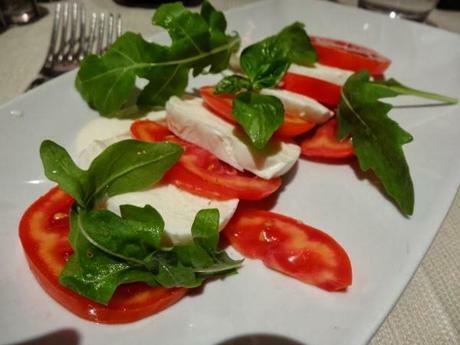 He offered to make me the best caprese salad I’d ever had and I skeptically said ok. And sure enough, it was really darn good. The mozzarella oozed milk when I cut into it, which combined with the tomato juices to make a creamy, tomato-y, heavenly mess. That mozzarella was unlike any I’ve had before, and it totally made the dish. 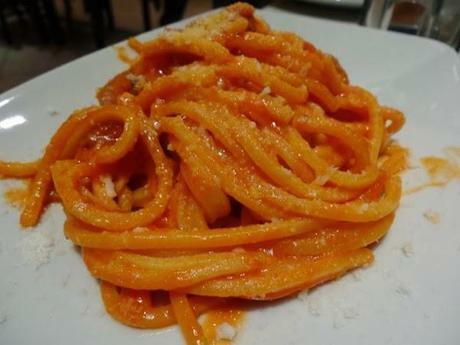 For my main course, I got bucatini all’amatriciana, which is pasta with a tomato sauce and chunks of guanciale (cured pork jowl). The tomato sauce was ok, but the meat was spicy, herby, chewy, and fatty, better than any other guanciale I had in Rome. Other little things about this restaurant turned the meal into even more of a success. Our waiter cut out the heart of Jeremy’s fried artichoke for him because clearly Jeremy had no idea what he was doing. Another perk was the delicious, fruity Montepulciano house wine. Finally, the waiters actually waited on us (unlike so many other places in western Europe). I know that the restaurant culture is different in Europe than in the U.S., but still, it was nice to have our water glasses refilled and to have people ask how the meal was. 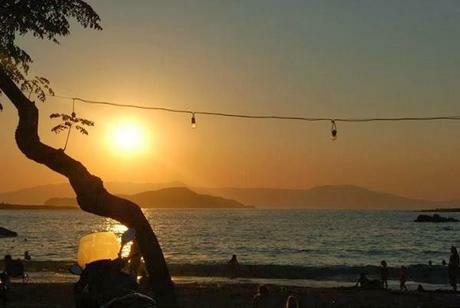 This was one of those picture-perfect meals where we watched the sun go down over Nea Chora beach. 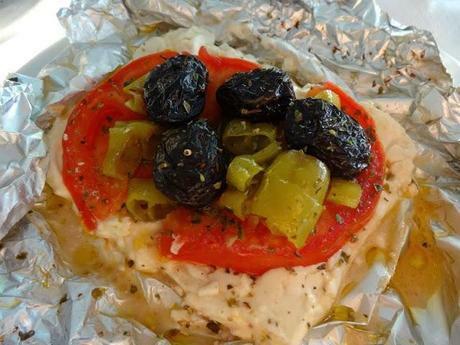 We started with some gooey grilled feta and peppers. For my entrée, I got a whole grilled fish, which I got to pick out from a lineup. The waitress was helpful in telling me where all the fish were from and which fish she liked the best. The fish came drizzled in olive oil and was deliciously moist. Jeremy’s entrée was the showstopper, however. 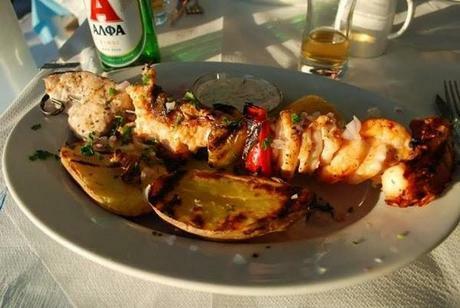 He got a seafood souvlaki, which was shrimp, salmon, calamari, octopus, and swordfish on a skewer and grilled. By far the most mind-blowing was the calamari. When Jeremy gave me some to try I had to ask him four or five times if that was really calamari; it was so tender that it melted in my mouth like butter. To end the meal we were served baklava (which I unfortunately could not eat), panna cotta, and shots of raki all for free thanks to the awesomeness of Greek hospitality. Eating at Kalina’s Guest House was like having your mom cook for you. Everything was homemade and hearty, which was good considering how cold it was and how much hiking we did there. For breakfasts we had things like toast sandwiches with lukanka (a Bulgarian sausage) and cheese, mekitsas (fried dough pieces), homemade yogurt made from sheeps’ milk, “fried slice” which was like French toast, and crepes filled with homemade apricot jam. 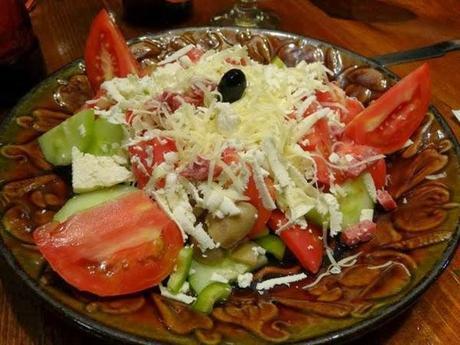 For dinner we always started off with one of the delicious salads, like Shopska salad, to keep up the appearance of being healthy. We subsequently ruined this appearance by ordering one of everything on the menu. 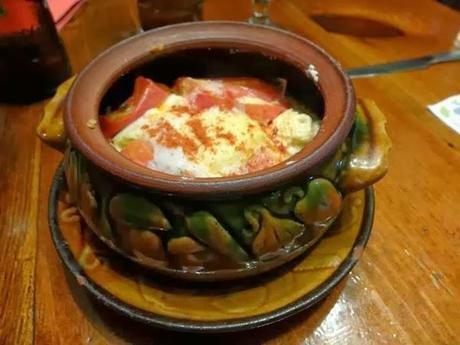 We tried things like rich pork stew; a shopska cheese pot with cheese, tomatoes, onions, and eggs; potatoes with cheese, ham and egg; kebapci, which were oniony pork meatballs; and garlicky mushrooms with cream and cheese. Everything was so cheap and delicious that it was hard to restrain ourselves when ordering! After wandering around looking for a place to eat and getting grumpy because nothing grabbed our attention, when we looked at the menu at Tinel we both knew it was going to be good and we immediately sat down at a table. 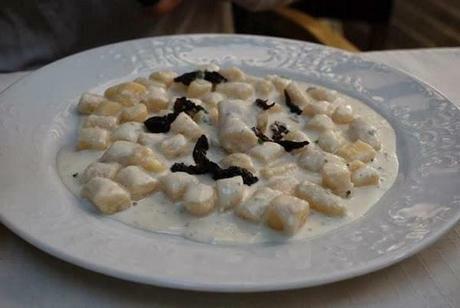 The gnocchi was probably the best I’ve ever had: pillowy homemade gnocchi were covered in a creamy gorgonzola sauce, punctuated with earthy and sweet bites of dried plums. Definitely not a flavor combination I would have ever dreamed of, but executed very well. We also got a plate of delicately fried calamari. 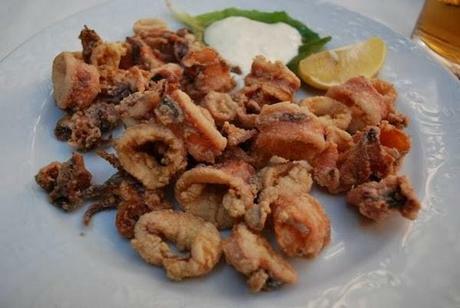 The calamari itself was fresh and tender, and the fried coating was super thin, crunchy, and perfectly seasoned. The only downside to this particular meal was that apart from another couple and a small Italian group that left right after we arrived, the restaurant was completely empty. Good for us, but our hearts wept for all those who missed out. And with that, my stomach is growling as I remember all of these amazing meals. Although I could write pages and pages about all of the great food we ate in Europe, these six meals stand out among the best. Simple dishes using the best ingredients, interesting flavor combinations, and unique restaurant atmospheres and all made these meals forever memorable.